In the UK, Safer Internet Day is organised by the UK Safer Internet Centre (www.saferinternet.org.uk), and this year’s theme is ‘Together for a better internet’. Childnet International, who form part of the UK Safer Internet Centre, have produced an online safety resources to help schools, parents and carers to support children and young people online. To celebrate the many positives of the internet, and to raise awareness of the issues that children and young people face online today, we deliver a range of activities for our learners throughout the year. At home, you can also discuss the importance of Safer Internet use with your daughter. We believe that internet safety education is a crucial element of the curriculum and an essential part of young people’s development. The information provided on this site is designed to help you become more aware of the safety messages that your daughter receives in school in order to reinforce them in your home environment. 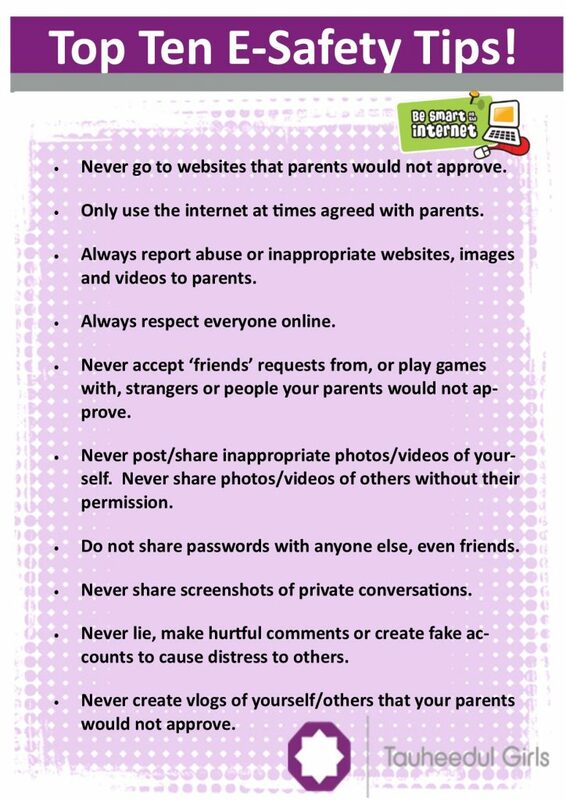 To read our leaflet on how to keep your daughter safe on the internet, please click on the link below.